Access to quality care for all remains NBCC’s priority. While we fight for that goal, one of NBCC’s highest legislative priorities this year is to enact legislation to waive the 24 month waiting period for Medicare eligibility and the 5 month waiting period for Social Security Disability Insurance benefits for individuals with metastatic breast cancer who qualify for social security disability. We are happy to report that on Thursday, June 14, Representatives Peter King (R-NY) and Kathy Castor (D-FL) introduced H.R. 6114, the Metastatic Breast Cancer Access to Care Act. Thanks to NBCC’s outstanding advocates the bill was introduced with 35 original cosponsors. Since 1991, the National Breast Cancer Coalition has focused on ensuring that all individuals at risk for or with breast cancer have access to quality health care. Waiving these waiting periods helps assure that women and men living with metastatic breast cancer have access to the support and medical care they deserve as quickly as possible. The NBCC 2018 Advocate Leadership Summit was held April 28 – April 30, 2018 at the Renaissance Capital View Hotel in Arlington, VA. This year’s summit focused on how to be bold advocates during these difficult times when policy makers are looking at so many other issues. The preconference program began with a Project LEAD® Workshop: “Early Dissemination of Cells That Become Lethal Metastasis.” The Summit featured fascinating plenary sessions on the progress of the Artemis Project, advocacy in the current political climate, the ethical issues surrounding cancer treatments, as well as an armchair discussion on the impact of DoD-funded research, and a Q&A session with Dr. Dennis Slamon. There were 9 skill-building workshops on topics such as how to participate effectively in a scientific peer review, ramping up critical appraisal skills, access to health care, genomics and breast cancer, and the NBCC initiative Campaign Vote Breast Cancer. Selected plenary sessions and workshops will soon be available to view on the NBCC website. In addition to a stellar substantive program, the Summit provided plenty of opportunities for networking and connecting with advocates from across the country. Advocates were also able to connect directly with the speakers during the Advocate-Speaker Meet Ups. These meet-ups provide a fantastic opportunity to have discussions and ask questions to the speakers in a smaller, more casual setting. NBCC's Annual Lobby Day once again was a great success! On May 1, nearly 200 NBCC advocates went to Capitol Hill to meet with Senate and House staff to advance NBCC's 2018 legislative and public policy agenda. 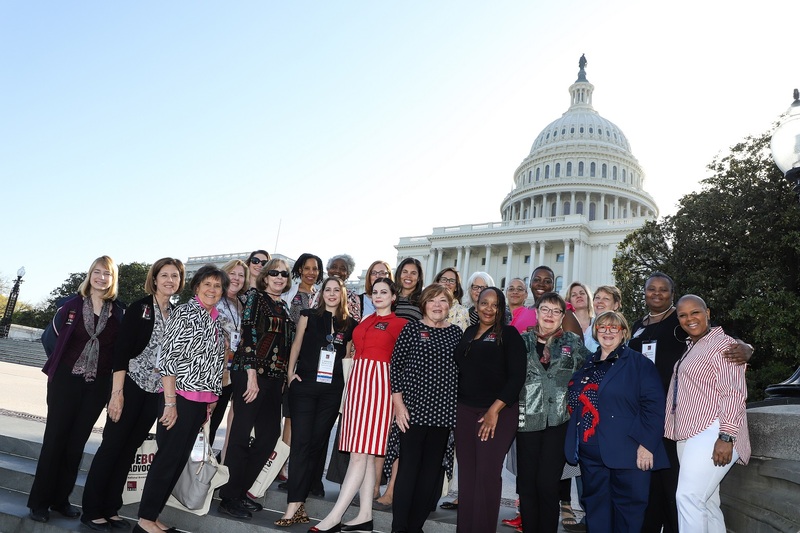 Advocates representing nearly every state spent an entire day on Capitol Hill conducting and participating in more than 200 meetings that resulted in significant increases in members signing on to our #1 legislative priority: $150 Million for the Department of Defense (DOD) Breast Cancer Research Program (BCRP) for FY2019 and sponsoring our #2 legislative priority: A bill to waive the 24 month waiting period for Medicare eligibility and the 5 month waiting period for Social Security Disability Insurance benefits for individuals with Metastatic Breast Cancer who qualify for social security disability. 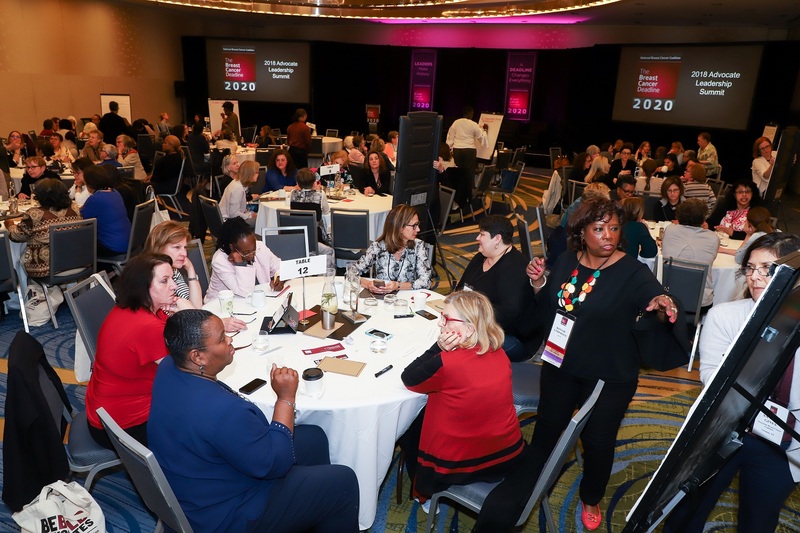 Mark your calendar for the 2019 Advocate Leadership Summit at the Renaissance Capital View Hotel in Arlington, VA on Saturday, April 27 – Tuesday, April 30, 2019 (Lobby Day). NBCC looks forward to welcoming over 45 advocates to the Project LEAD® Institute July 22-27. This diverse group of women and men will travel from almost 20 states and 3 countries to meet in La Jolla for a six-day intensive science course for breast cancer advocates covering the basics of cancer biology, genetics, epidemiology, research design and advocacy. The course provides a foundation of scientific knowledge upon which participants can build to strengthen and empower themselves as activists. Project LEAD® has received numerous accolades for supplying the education, tools, training and action that enable breast cancer survivors and others to take leadership roles in the breast cancer community. Project LEAD graduates are better able to communicate scientific and medical information in their communities and participate in decision making for breast cancer research and policy. This month the American Society of Clinical Oncologists (ASCO) held its annual meeting in Chicago. Each year tens of thousands of participants from around the world -- researchers, clinicians, advocates, and representatives of industry and government -- attend this conference, to network and hear about recent research results. And each year we eagerly look forward to new discoveries that will be announced. Unfortunately, there is usually little news of great import for breast cancer. This year was not much different. This year’s meeting theme was Delivering Discoveries: Expanding the Reach of Precision Medicine. Precision medicine is a new “buzzword” in cancer, but it is not yet clear if it has true meaning for improving treatment and saving lives in breast cancer in addition to the targeted therapy that already exists. The biggest newsmaker at this year’s meeting had nothing to do with drug development, but rather more evidence that “less is more” regarding treatment. The long-awaited results of the TAILORx (Trial Assigning Individualized Options for Treatment) trial were presented during the Plenary Session and published simultaneously in The New England Journal of Medicine. Sponsored by the National Cancer Institute and coordinated by ECOG–ACRIN, TAILORx has been widely reported on and these new findings will likely have impact on clinical practice. These new results showed that many women with hormone receptor-positive, HER2-negative, node-negative breast cancer receive no benefit from chemotherapy and can be treated effectively with endocrine therapy alone, depending on their age, and Oncotype DX Breast Recurrence Score (RS). The data indicate that 70 percent of women who are older than 50 and have an intermediate range RS of 11 to 25 and of women 50 or younger whose RS is lower than 16, can avoid chemo. This means that more than 85,000 women a year in the United States — could safely forgo chemotherapy. NBCC played an instrumental role with TAILORx from the beginning, taking the lead in advocate involvement in patient enrollment, protocol design, the data safety monitoring board and the trial steering committee. For more information, please see NBCC’s TAILORx statement. In more news of interest to breast cancer advocates, an abstract presentation on the phase III PERSEPHONE trial showed treating early-stage, HER2-positive breast cancer with trastuzumab (Herceptin) for 6 months had the same disease free survival outcome as having the treatment for 12 months and caused fewer heart problems. Trastuzumab is a targeted therapy used as a standard treatment for HER2-positive breast cancer. The current standard of care involves taking trastuzumab for 12 months. Read the summary write-up of the symposium here. Drive Away in a 2018 Volkswagen Atlas and Help End Breast Cancer! Thanks to a generous donation from Lexus of Englewood and Volkswagen of Union, NBCC is auctioning a 2018 Volkswagen Atlas V6 SEL on Charitybuzz, with proceeds going to our mission to end breast cancer. 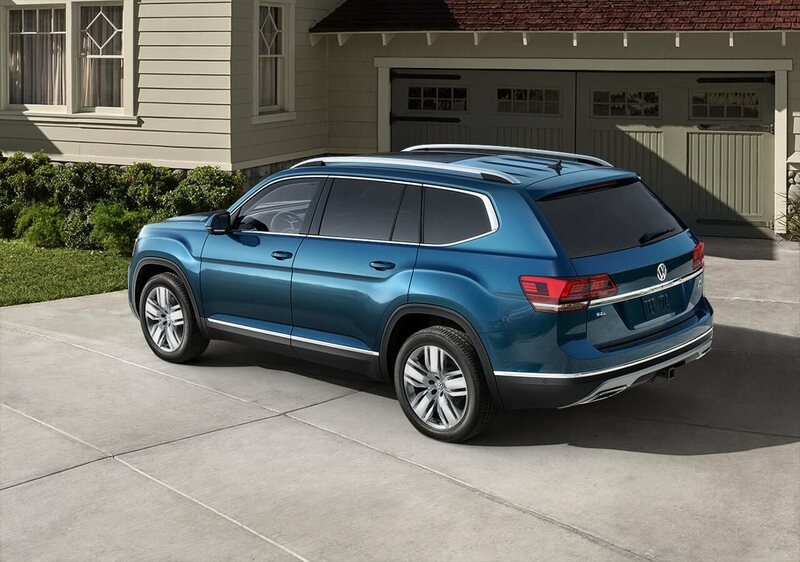 The 2018 Volkswagen Atlas is VW's midsize SUV with 3-rows of seating. The NBCC auction features a VW Atlas with tourmaline blue metallic exterior, titan black leatherette interior and plenty of features. Learn more here and place your bid before the auction closes on June 28th. The second annual Women with Balls® fundraiser in New York, hosted by Liane Linder was a great success. The evening was full of fun, laughter, and amazing costumes – and the competition was fierce! With more than 100 attendees, and 13 teams, the evening included a champagne reception, followed by lots of food, bowling, awards, and prizes! A record $65,000 was raised at the event to help end breast cancer. Thanks to Pfizer for sponsoring the event and to all who supported! Preparations have already started for the 2019 event – Save the Date! Tuesday, May 7, 2019 at Bowlmor in Times Square. Please join us in celebrating the 18th annual Les Girls Cabaret on Sunday, October 7, 2018, at the Avalon Hollywood. This year we will honor Armando Giuliano, MD and the award will be presented by Julia Louis-Dreyfus. The event will continue our tradition of a witty and fun evening with plenty of song and dance – all to raise funds for NBCC. Further information and a reservation form can be found here. Join us on Monday, October 29th for the 23rd Annual New York Gala. We will honor Mark Alles, CEO, Celgene and two breast cancer grassroots advocates for their commitment to Breast Cancer Deadline 2020®. This annual fundraising event should not be missed. Find out further details or RSVP here.